Anyone study Kali? Specifically the Karambit? Just got these puppies in, and I'm loving them so far. Obviously only using the trainer (on the right) for the most part. Looking up a lot of technique books/videos/etc. since there's no Kali school anywhere near me. I have a good friend of mine, Guru Harley Elmore. He is in Texas, and runs Warrior's Way. He trains in Sayoc Kali. His videos are on YouTube, and he has video sets. This guy is very legit, he trains with Dan Inasanto. Look him up and I am sure he can help you. Here is one of my favorite videos that he does. Didn't actually link to a video. Very interesting! Thanks! Unfortunately, I don't have a training partner at this point. Even so, it's definitely one more thing to study. I have a karambit. Those suckers are mean. Not something to wield unless you have nothing left to lose. True. Definitely not the primary EDC, but a good backup to have. Of course, learning to use it properly is quite important. I took a class on karambit fighting a year ago while I attended a martial arts festival. The instructor knew what he was doing with it; he is very skilled man. If you look on YouTube I'm sure there are people who have learned how to use it properly. Yea I've found a couple guys who have some really good training videos up. Just gotta take the time to study it. You got that right! I've discovered, even with my limited training, that the karmabit is as much, if not more, about control than it is about damage. There's just so much that it can do, even without an edge, like you said. The thing about a karambit is, it's one of the best, tactically sound, combat knife designs around, and it's been around for a long long time, and still relevant, so it passes the test of time. Because of the way it's typically held in the underhand, blade forward position, someone with even rudimentary boxing skills can do some serious damage with this blade in their hands. Hey man! Glad to see you back. Really appreciating the discussion here too. Kali practitioner here, figure I'd weigh in a bit. 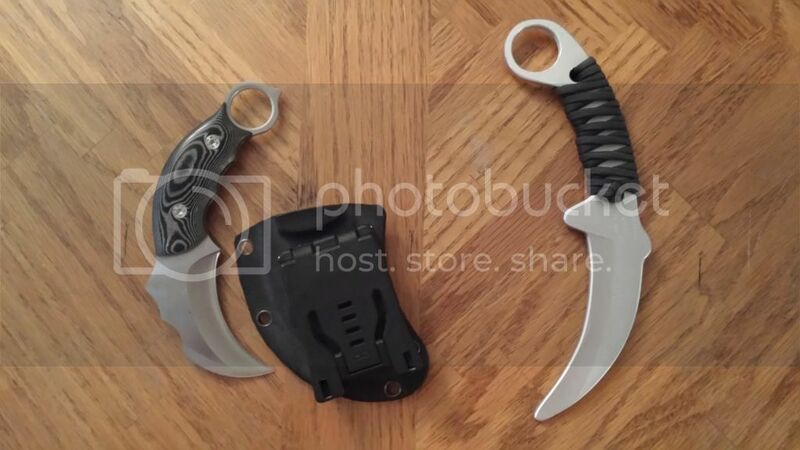 xoek is right about the kerambit being one of the best out there as far as tactical knives. Lots of nasty tricks, hooking limbs/weapons, etc. If you have mobile wrists, it's doubly dangerous, and the finger loop effectively negates the threat of disarm (save for having said finger removed...). It also meshes well when mixing in some Silat or other ground work, which I'm inclined to say is where it originated as a martial weapon. The trainer is fun to play with against stick, dagger, empty hand, especially when working in those wrist rolls. Glad to have you here!! Like I said before, the more I learn about the karambit the more I get the feeling it's a control weapon rather than a damage weapon. Sadly, I'm just not in a place financially that I can afford to sign up at the Kali/Silat school here in StL. But it's definitely on the radar. Its definitely a short range weapon, and devastating, not necessarily just control, though it lends itself better to that than a straight blade. Plenty of steel in your hand when compared to other knives. And bummer about no available training. I'm fortunate enough to have an instructor in town (small town), so have been spoiled for a lot of years in that regard. Thanks for the insight. Short range for sure. I'm certainly a noob with it at this point. There actually is a school here that teaches both Kali and Silat, but it's just not in the budget right now. It will be though. That's for sure.